RARE OPPORTUNITY: This secluded 1.1 acre property provides 180-degree marsh views and 600+ feet of water frontage (6x more than the average island lot). Natural light is captured in every room with a desirable open concept and split floor plan that is move-in ready. The home boasts 11' ceilings, new quartz countertops and new flooring. The Master Suite has panoramic views of the marsh, flex room & over-sized closet. Additional Home Office. Gas range & fireplace. Home can be expanded approx. 660 sq ft w/ stairway above garage. Enjoy unobstructed views from every room, your screened porch, open-air deck, or launch a kayak right from your yard! Beautiful golf and lagoon view home that is move-in ready. Perfect for entertaining with large kitchen and living area and with a split bedroom plan. This home sits on .82 acres and low maintenance wooded lot. Lagoon and golf views. Callawassie Island Dogwood course hole #3 green. Kitchen was remodeled in 2016. New stainless steel appliances. Carpet replaced in 2013 and 2016. HVAC replaced in 2017. Callawassie Island amenities include a 27 hole Tom Fazio golf course, fitness center, 2 pools, 2 clubhouses with dinning, deep water docks for fishing and relaxing, kayak launch with storage, Certified Community Wildlife Habitat. 24 hour security. 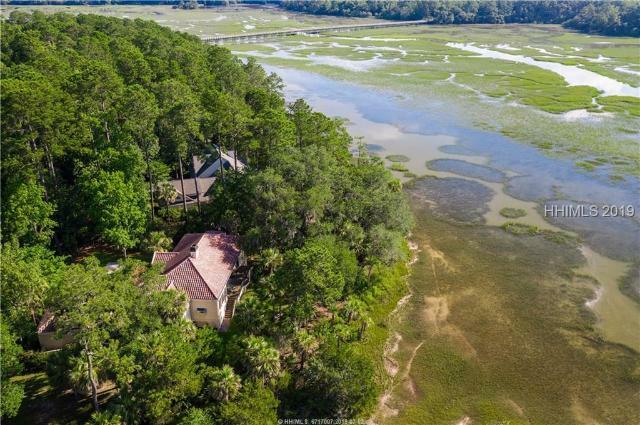 Spectacular lagoon setting in this distinctive low country home on Callawassie Island. Entering through the two story foyer you step into the Great Room w/granite surround gas fireplace. French doors lead you to a screened porch w/entrances from the Dining, Great, and Master Bedroom. Master suite on first floor, with huge walk-in closet, bath w/jacuzzi tub and his and hers granite top vanities. Gourmet kitchen with Jenn Air gas/stainless appliances, built-in island, and spacious butlers pantry. Hand finished Brazilian Walnut floors throughout first floor. Stairs and two bedrooms feature custom designer carpet, and large bathroom. Enjoy easy living in this one level Lowcountry gem on a .56 acre wooded lot next to a nature preserve on beautiful Callawassie Island. Open floor plan with lots of natural light. Chestnut wood floors throughout main living area; extensive crown molding; stone/marble tile in all baths; plantation shutters; & on-demand water system. Large MBR suite & bath, two guest BRs each w/private baths & large closets. Updated kitchen with granite and SS appliances. Screened porch + deck for entertaining & enjoying beautiful views of your private lagoon & surrounding nature. Large two level attic above garage for storage or expansion. A beautiful marsh setting enhances all this charming 4BR/3BA home has to offer. This open floor plan takes advantage of the water view while maximizing light exposure from almost every room. Renovated kitchen with granite, stainless appliances & large pantry is a cookGÇÖs dream. Separate guest quarters lead to a 4 season porch. Large deck w/retractable awning make entertaining fun. Master with custom tiled bath gives deck access. Bonus w/full bath can be used for guests, office area, or an entertainment room.Recently upscaled and painted with new marsh colors. A must see! This is a Lowcountry dream. Convenient to Hilton Head and Beaufort. Ideally situated on Dogwood 1 of the Tom Fazio Golf Course with fairway view. Very short walk to the Clubhouse, pool, tennis, exercise & golf range. Ideal 2nd/vacation home, with demonstrated income stream of $37,500+ from short term rentals. Guests have access to all amenities including golf. $45,000 of recent improvements, including roof, HVAC, Trex deck, remodeling of kitchen, master bath, & 2nd bath, new paint. Includes most furniture and golf cart. Some owner financing is available. 3 Spacious Bedrooms & 2 Baths with Open Living space where you enjoy the welcoming fireplace. Panoramic views bring the outdoors inside & make island living the best! New kitchen renovations-granite countertops, paint, refinished cabinetry, hardwood flooring & appliances. New bathroom sink vanities (double in Master) neutral paint & light fixtures. Hardwood flooring. Trey Ceilings. Nice storage. Separate laundry room. New roof in 2017. Community dock only 1 block away. It is a wonderful relaxing new home. Lots of terrific amenities too-2 Swimming Pools, Tennis, Golf, Clubhouse, Fitness Center (new in 2017), 4 Docks, Safe & Secure. Come see! Magnificent sunset and deep water views on the Colleton River with direct access to the Intracoastal Waterway.-á This one-acre home site offers a lush landscape, high elevation and mature trees.-á Conveniently located on the Callawassie Island, midway between Bluffton and Beaufort, there are no time restrictions to build.-á Enjoy resort-like living with Clubhouse Dining, Tennis, Fitness, Boat and Kayak Docks and optional Golf.-á Live the Dream...365 days a year!